'Twas the night before Christmas, and all through SuperPhillip Central, a new review was posted for a charming little baseball game. The boys of summer might be in hibernation with it being winter and all, but that hasn't stopped Metalhead Software from creating an arcade-style baseball game for the off-season regardless! Here's my review of Super Mega Baseball. Lately, if you wanted your baseball fix on a PlayStation home console, you needed to play Sony's own MLB The Show franchise, a series that isn't known to be very beginner-friendly, being a simulation of America's national pastime and all. 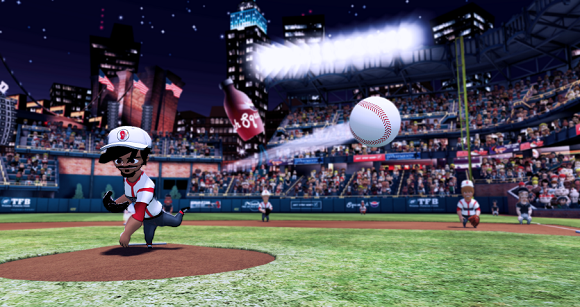 It's taken a small, dedicated team of individuals at Metalhead Software to create a much more accessible baseball game for their first foray as a team in creating a game. While nowadays "more accessible" might make you think "dumbed down", Super Mega Baseball couldn't be anything further from the truth. It's a game that swings for the fences, and while it doesn't get a grand slam, it does knock one out of the park with spectacular style. The accessibility of Super Mega Baseball is in how easy it is to learn the controls. Even after the controls have been learned, there's the challenge of beating opponents that presents itself. If for some reason you forget how to do something while in a game, you can hold the Start button to have a tutorial menu brought up. a muscle in the process! Pitching is relatively simple, requiring the player to select a type of pitch by pushing the right analog stick in one of eight directions. Then it's a matter of selecting a place to throw the ball and line up the cursor with the target mid-flight to create the best pitch possible. Missing the target by a lot makes for a pitch that is easy for the batter to get a piece of, while getting the cursor as close to the target as possible results in a very strong pitch. This pitcher puts the hot sauce on this pitch! The greatness of Super Mega Baseball is how you can set the controls to be as simple as pressing X to throw as well as hit pitches or more complex as drawing an analog stick back and then pushing it forward to swing. Fielding is in part handled by the AI, moving automatically under fielded balls, though it's not entire streamlined. You do have to make the occasionally jump or dive for the ball, and there is the requirement of throwing the ball to the right base to get the desired out. As each base is designated with a face button (e.g. pressing the circle button will throw the ball to first base), it's a quick concept to learn and makes playing defense fun, engaging, and simple all at the same time. 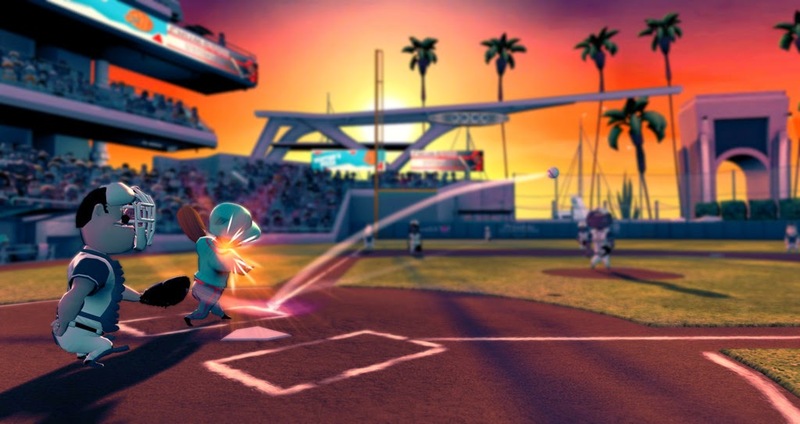 The Ego system allows players of all skill levels to enjoy Super Mega Baseball. The higher the Ego level, the more difficult the CPU becomes. This ability to fine tune the difficulty of the game makes the game able to appeal to a wide audience. Mega Baseball as hard or as easy as you want. 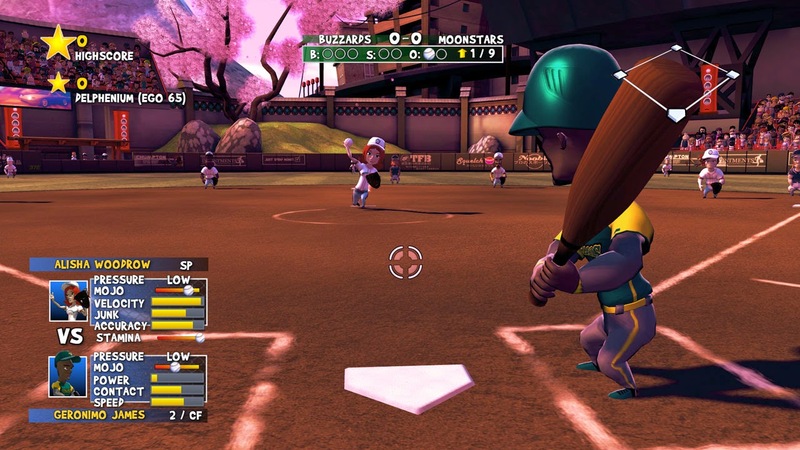 Super Mega Baseball's main modes consist of one-off exhibition games and the Season Mode. The latter pits all twelve fictional teams, such as the Beewolves, the Sirloins, the Crocodons, and more, against one another in a short, medium, or long length baseball season. It's this mode that offers plenty of stats for you to track, whether it's for your team or the entire league. On top of Season Mode is the ability to fully customize the look of each player on each team. Whether it's their hair colors, hair styles, facial hair, body type, headgear, or names (but seriously, why would you want to change the adorable name of Johnson Swanson? ), there's plenty of means to alter your teammates your way. MLB-certified, they're allowed in this game. 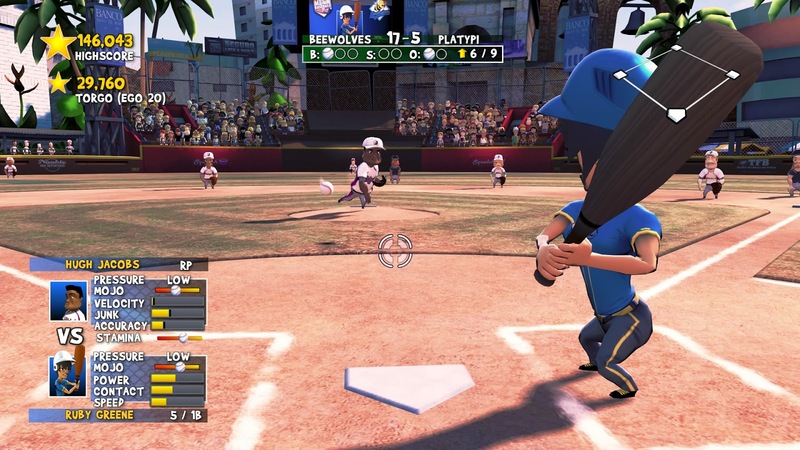 The cast of players in Super Mega Baseball are indeed larger than life, cartoon-inspired caricatures that have a fair amount of personality. Little things like tears that pour out of a hitter's eyes when he or she strikes out and celebrations when a home run is hit add to the charm of the game. Super Mega Baseball's four stadiums are brimming with the same personality and wackiness that exudes everywhere else in the game. Although, it would have been nice to see a couple more stadiums, or at least the ability to choose the time of day each game takes place in. Additionally, some long loading times and spelling issues detract from the overall package as well. Outside of my desire for more stadiums and some small technical flaws, Super Mega Baseball sadly only offers local play. There is no online multiplayer to speak of, though there are leaderboards to be found. However, this is a pretty poor substitute for being able to play with folks around the country and the world. That said, Super Mega Baseball does offer local play for up to four players, two to each team, splitting up the duties between batting, pitching, and fielding each inning. He's opening up a can of corn with this swing! Super Mega Baseball is best played in small chunks. However, at the same token, it's the type of game that you will come back to time and time again. It frees you from caring about how faithful the graphics are to the real thing, instead delivering a satisfying to the eye visual style. 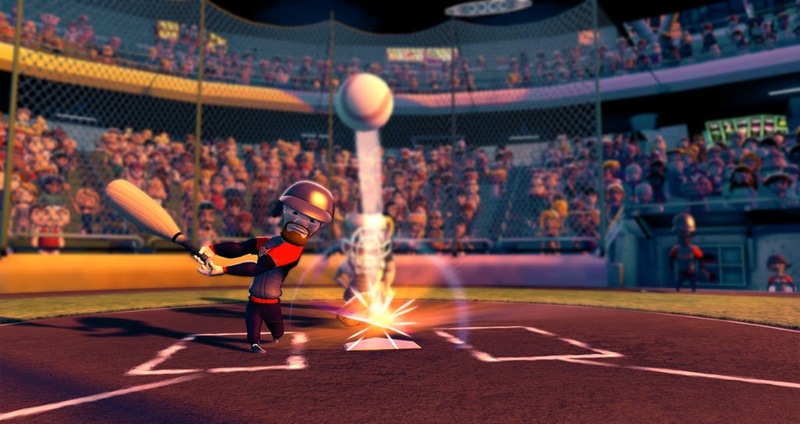 The game makes for a baseball title that all skill levels can pick up, play, and enjoy. All in all, Super Mega Baseball is worth several trips around the bases. It's got heart, it's got fun, and it's got just enough to keep you coming back for more.